The Snody Big Boss amps up the classic Snody Boss knife by almost two inches overall and has been decked out with premium S35VN steel and lots of accessories. The Snody Boss is a classic Snody knife, easily recognizable to his fans. The factory version has been decked out with premium S35VN steel and lots of accessories. 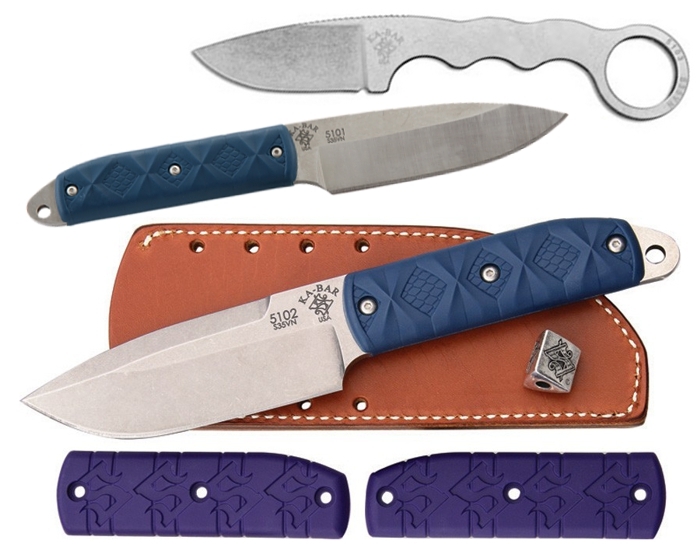 Each of the above knives come with two sets of textured handles--a blue "Reptile" version is mounted to the knives and a purple "Dolla Holla" version highlights Snody's stylized "S" logo and is included in the package. We've also thrown in a custom-designed Schmuckatelli Co. bead, coordinating 550 cord, and a high-quality leather sheath. The Snody Snake Charmer is a neck knife that does just that, while beckoning to the roots of a similar past offering from KA-BAR, the bird and trout knife. Made from S35VN stainless steel, it comes with a custom-designed Schmuckatelli Co. bead, 550 cord and a molded hard plastic sheath.